Many of the residences and businesses of the Falaise community are situated close to the Pat Bay Highway and the Royal Oak interchange, as indicated on the maps page. Traffic noise from the Highway and the Interchange affects the quality of life for many residents and disturbs the quiet that would be expected for funeral homes and a cemetery. Bob spoke to the problems and Stew outlined possible options for funding to address the problems. Council discussed the issues and a motion was passed instructing the Mayor to write a letter to the Minister of Highways, the Minister of the Environment and to local MLAs requesting support to get funding from the 2014 New Building Canada Fund or similar programs. With regard to the issue of parking for large funerals, Councillor Brownoff asked Saanich Engineering to look into the problem. Engineering suggested that the problem seemed to be one of enforcement, but it is more than this. There is simply not enough parking available near the funeral homes. Their presentation is the first item on the agenda for the Council meeting starting at 7 pm on Monday, March 11, 2019. We have obtained traffic statistics for the Pat Bay Highway near the Royal Oak exchange and it is summarized in this graph. 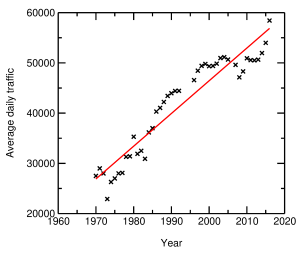 The red line is a linear fit to the data and it shows that the traffic volume increases by about 650 vehicles per day, per year. An appropriately designed noise wall, between the Highway and Falaise Drive, would significantly attenuate the traffic noise and produce a less stressful environment for residents and visitors to the funeral homes and burial park. 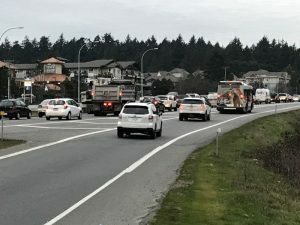 Traffic on the Pat Bay Highway at or near the Royal Oak Interchange has grown to where it is now producing unacceptable noise levels, affecting the quality of life and real estate values for the residents living on or near Falaise Drive. This residential community was established when the Highway was only two lanes. It is now a four-lane, controlled-access highway and traffic volume near the Royal Oak Interchange, built in 1970, has more than doubled, increasing from 27,000 vehicles/day in 1970 to 58,000 in 2016. The Highway was widened and the Royal Oak Interchange was constructed with no noise abatement wall or berm to shield the Falaise Community. 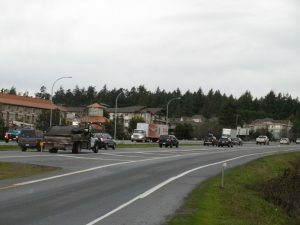 In co-operation with the District of Saanich, take immediate measures to reduce the impact of traffic noise on the entire Falaise Community by constructing a suitable noise abatement wall running from Royal Oak Drive to the north end of Falaise Drive, similar to the berms and walls constructed in front of other residential communities along the highway during its widening process. Dated __________ day of ____________________ , 2018 . Of the 176 addresses within the Falaise community, we were able to speak with someone at 141 of these locations. We obtained signatures from 243 individuals supporting the petition. Of those contacted, 88% were in favour of the petition. The petition has been submitted to Minister Popham who we expect to address it at the end of the present session of the legislature. This paper presents a study from the US on the impact of noise walls on house prices. The authors show that noise mitigation can increase prices by 15%. The BC Ministry of Transportation and Infrastructure policy on traffic noise is available here. In addition to considering the impact of noise on permanent residences it also points out that limiting noise is important at places of worship and cemeteries. 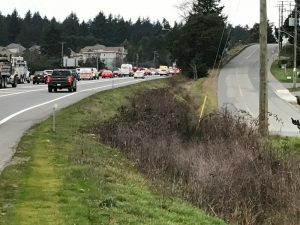 There are two funeral homes and a large cemetery near the Pat Bay highway and traffic noise disturbs the tranquility near these facilities. The reporter captured the essential issues although the petition was not mentioned. In the last paragraph, the reporter linked the idea of a noise wall with Trump’s claim that Mexico would pay for his border wall but the FCA made no such association and we would not have approved it, had we been asked. Saanich councillor, Fred Haynes, contacted the funeral homes and burial park to understand how a noise wall might impact their business and to outline how Saanich might help. All three organizations would be pleased to have reduced traffic noise, but they need to be sure that a wall would not reduce their visibility. The President of the FCA, along with one Director and one resident, met with Lana Popham on July 3, 2018 to discuss the petition signed by FCA residents and the next steps towards reducing traffic noise. The meeting was also attended by representatives from the Ministry of Transportation and Infrastructure (MOTI). Lana proposed that she coordinate a meeting with Saanich Council to explore options. The MOTI will look at similar situations throughout the province to determine how they might partner with Saanich. We expect an update before the end of summer.